I kept walking by these tables. Should I get them? Let me walk by them again. thinking, do I really need it. Where will I put it? Then you consult your blogging friends. What do you think? they landed in my car. but plans change. Although, they may land in another room in the future. and I have relocated the tea table to another area. These last 6 weeks have been quite a traveling whirlwind. Glad to be home and in full Christmas decorating mode. We did our usual Florida trip to spend our Thanksgiving with family. Have a most beautiful day. I will be back with lots of Christmas decor! I love them! I could not have left without them either. I have never been to the shops in Ft. Myers although our family has a place in Bonita Springs (right next door). I’ll have to add that to the list of things to do on my next trip. I’m happy they came home with you. They look beautiful. Love them.love your blog also ..we vacation near Ft Myers. They are wonderful! I love nesting tables. So glad you bought those. I love them. I love them! They are perfect, I could actually see me with them too:) I have been on a decorating whirlwind too, off to do our clubhouse this morning! Tomorrow I am helping a neighbor:) But I enjoy it. Have a great day decorating!!!!! 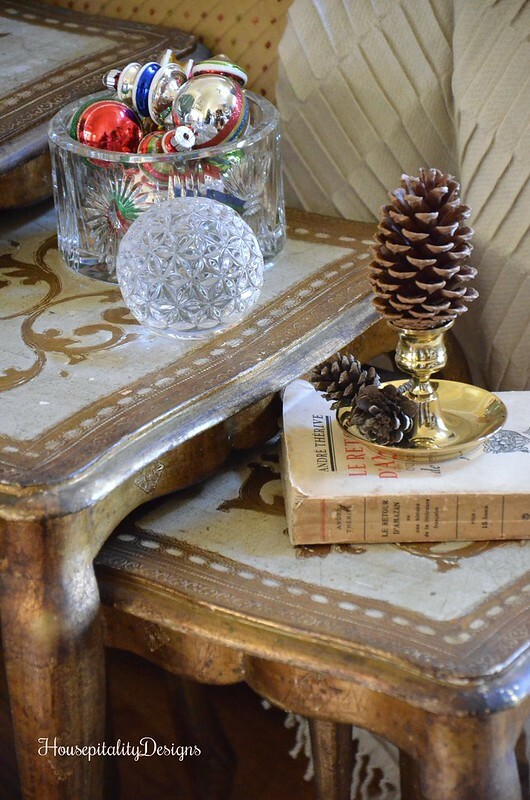 Pinky’s recent post…Our first Christmas Everyday table!!! They’re beautiful, Shirley, and the type of item that can be moved around easily to new spots. So glad you sprung for them. Beautiful! You find the best things!!! I love your pinecones. I can’t have any at all anymore thanks to Izzy who thinks they are a great treat 🙁 Yet another decorating avenue down the drain… LOL! Shirley, I love your beautiful new tables! I saw a set once and wish I would have bought them. I know what you mean about the traveling whirlwind. I’m on the road this week with my hubby. He travels a lot for work and since I home school my two children still living at home we decided to go with him this week. I hope that you have a happy Monday!!! They are perfect Shirley! 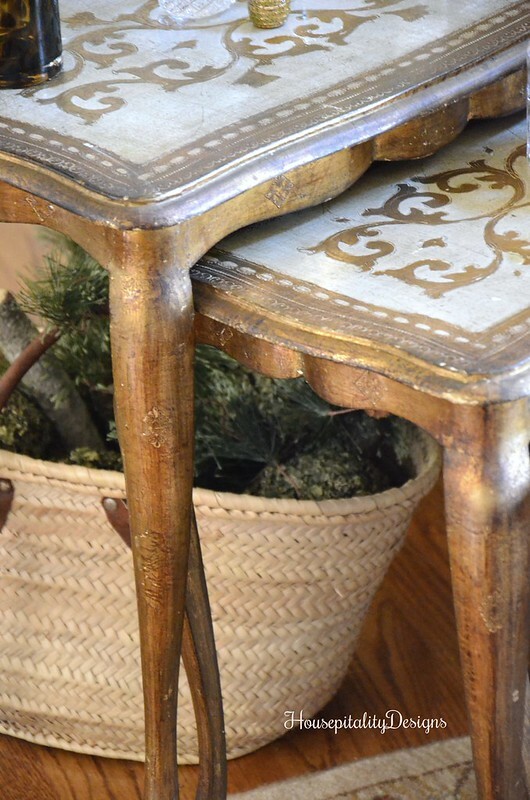 The french nesting tables look so good next to your sofa. They’re a perfect addition to your lovely room. They are lovely Shirley and you styled them so perfectly! 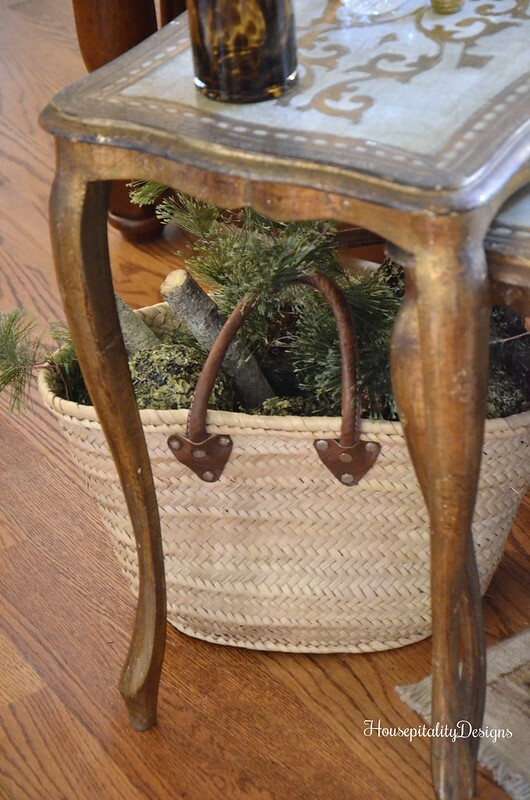 I have a set of nesting tables (not nearly as pretty as yours) and now you’ve given me some great ideas on where I can put them! 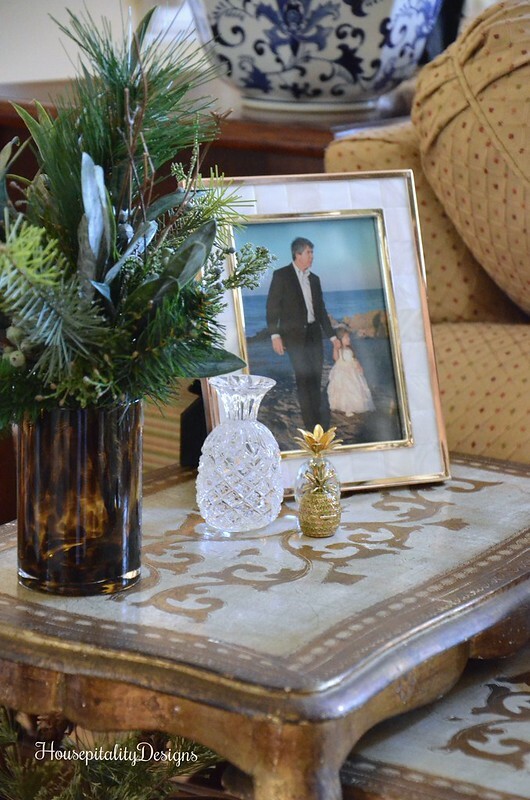 Shirley – the tables are lovely with that touch of gold. So pretty. A good choice! 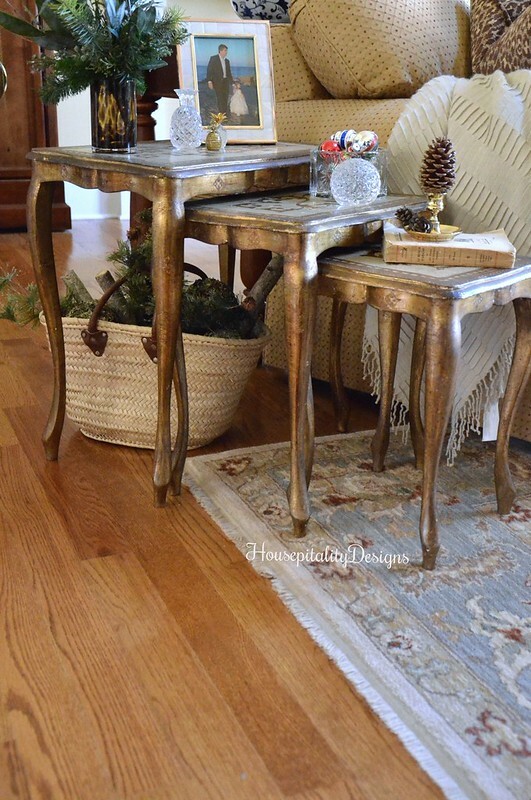 Love the nesting tables! You and I both think alike and always scout out vintage/antique shops when traveling. We have a short trip planned to PA later this week to visit my MIL/SIL and family. Of course, I always have to take a detour by Lemoyne to visit our favorite place since its on the way. Have a great week and happy Christmas decorating! I am so glad you got those beautiful Italian nesting tables! 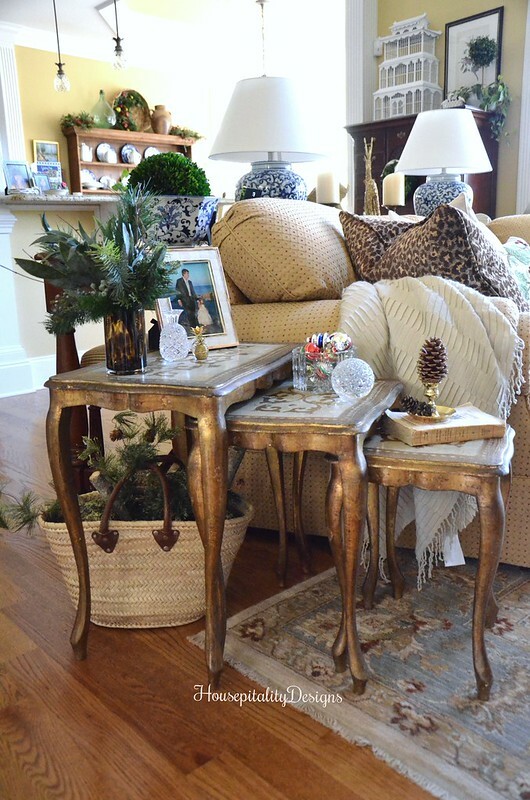 They are gorgeous beside your sofa…I have mine in the sunroom right now using for the Cristmas season. Great find! 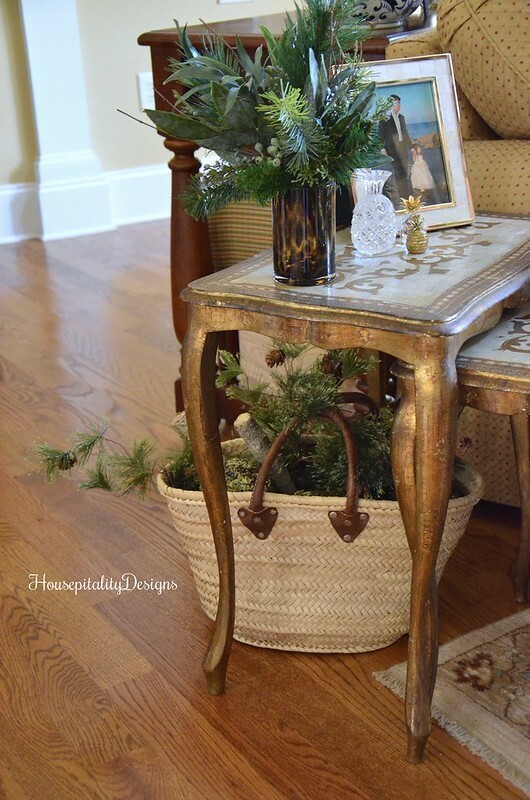 Love your blog and always enjoy seeing your new finds and how you display them. I love the tables and esp love how you have them placed and decorated for Christmas. Gorgeous tables. I love Florentine tables and trays and would love to have one myself. Looking forward to seeing your home all decorated.